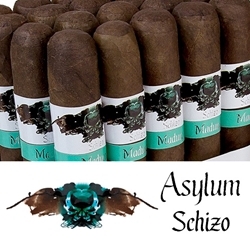 Handmade in Nicaragua by the CLE Cigar Company, the Asylum Schizo line has risen to become one of the top-selling hand-rolled premium cigar brands on the market today. Why is this cigar so good? The blend of Schizo consists of all-Nicaraguan tobaccos packed full of combinations of long and short fillers. This process gives them a mild to medium profile that consistently burns well with a flavor and aroma that’s hard to resist. Go Asylum and pick up one of these bestselling premium cigars today! Try one of the varieties of sizes and flavors listed below. Each of these styles are available today for a discount price! Call us for more details!